After taking pictures of the cherry blossoms in the Imperial Palace Park, I made my way back to the cathedral. I think I had about fifteen minutes to spare, and I spent that time finding a pew and settling in while the choir practiced. I wish I could speak more to the experience, but it really wasn’t that much different than previous Masses in Japanese that I’ve been to. I mean, I was pretty attentive to the homily even though I had no idea what the priest was talking about! I’m sure it was edifying and educational. As in previous Japanese Masses I’ve been to, the choir sounded beautifully awesome singing hymns in Japanese. After Mass, I checked out the book/gift shop next door to the cathedral. 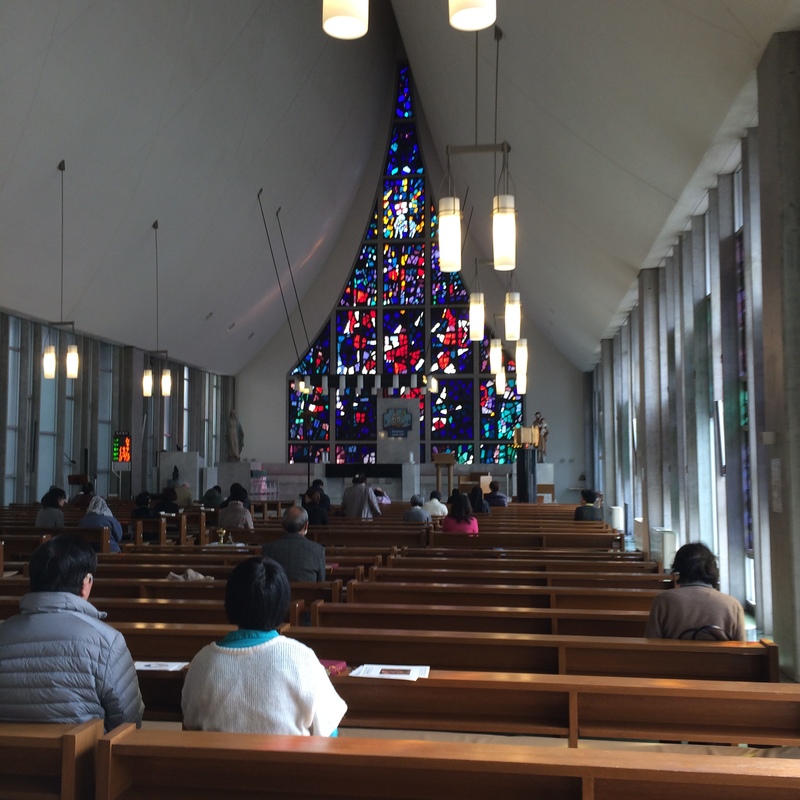 When I walked in, I realized that wow–the Daughters of St. Paul must have exclusive rights to running cathedral bookstores in Japan or something because this is now the third cathedral that I’ve been to with a bookstore run by the Pauline sisters. When I finished browsing the bookstore, I hunted around for a place to eat. 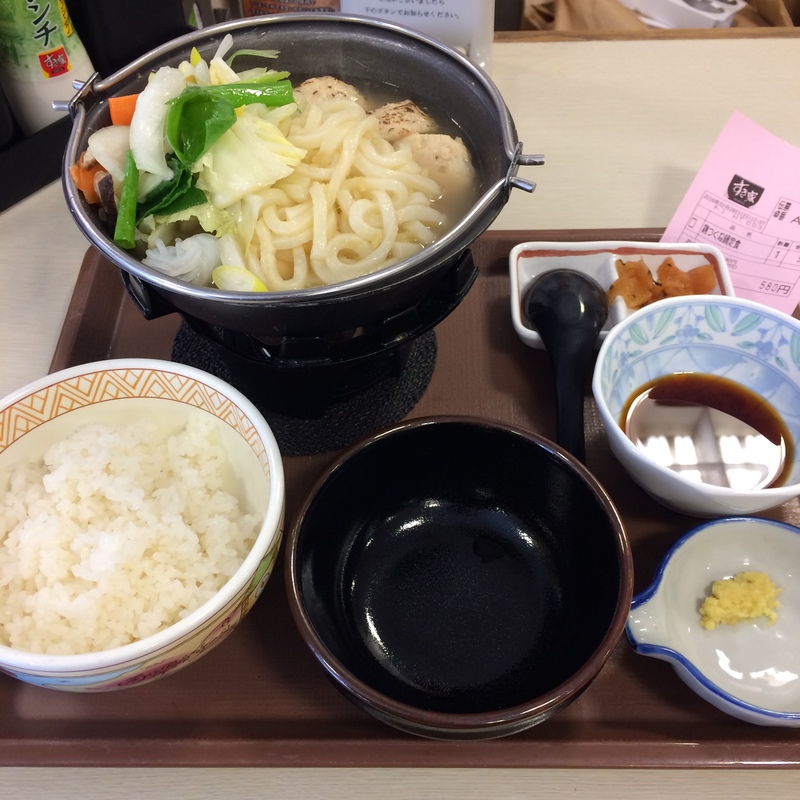 I stopped at a chain Japanese fast food restaurant that I’m familiar with, and I ordered a hot pot-looking meal set that looked tasty. And it was! Burned my mouth a little because I didn’t wait for the noodles to cool off in the separate bowl, but it was worth it. After the cathedral and lunch, I decided that it was time to say goodbye to Kyoto and slowly make my way back to the bullet train station.